Parish Pastoral Centre, Willbrook Road. A native of Cavan he worked for a time in the Civil Service before beginning his journey to priesthood with the Divine Word Missionaries. He was ordained in 1979 and incardinated into the Archdiocese of Dublin in the early eighties and since then has ministered in seven parishes across the Archdiocese. He enjoys a spot of golf, reading and classical music. St Mary’s Presbytery, Willbrook Road. I grew up in Ranelagh. I was ordained for the Dublin Diocese in 1978. I have served in the parishes of Kilmacud, East Wall, Whitehall, Churchtown, Ringsend and Monkstown. I am very glad to be back in this party of the city. I am familiar with this area from my time in Churchtown. I thank you all for your kind welcome I have received. I look forward to meeting more parishioners over the coming weeks. Matt was born in Booterstown Co. Dublin. He is married to Patricia, and they have two children and they live in Churchtown. 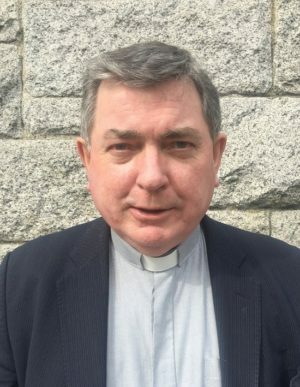 He was ordained a Permanent Deacon for Dublin Archdiocese in June 2016 and was appointed to serve in Rathfarnham parish by the Archbishop of Dublin, Diarmuid Martin commencing in September 2016. Deirdre has been actively involved in Church life since she was 16. As a young adult she spent three years giving school retreats with the Marist fathers. For the next twenty two years she was a contemplative nun. She came home when her father was ill. She worked as a college chaplain for one year and since 2008 she has worked for the Archdiocese. She has been with the parish of Clontarf for the last eight years. Deirdre is very happy to be here in Rathfarnham and looking forward to meeting you all. Born in Finglas West and now living in Lucan, I am a dad of two boys under 2. I spent most of my life working in printing and book binding that was until 2016 when I started working for Liturgical Publications. In this role I was actively involved in the Communications aspect of over 50 Parishes throughout Ireland including the Parish of the Annunciation here in Rathfarnham. I am very pleased to be working here in Rathfarnham and I look forward to meeting you all in the near future.